Bendable screens will soon have a brain that can tell when you're manipulating them into different directions. The technology, which will be unveiled by AU Optronics (AUO), has been applied to a 5-inch bendable AMOLED screen and takes the form of a sensor that is designed to help improve the experience for the user. AUO's idea is that by detecting the size and direction of any movement it can create a user interface that perfectly complements the regular touch functions of the device and the prototype represents the first time the technology has been presented by an OLED display manufacturer. 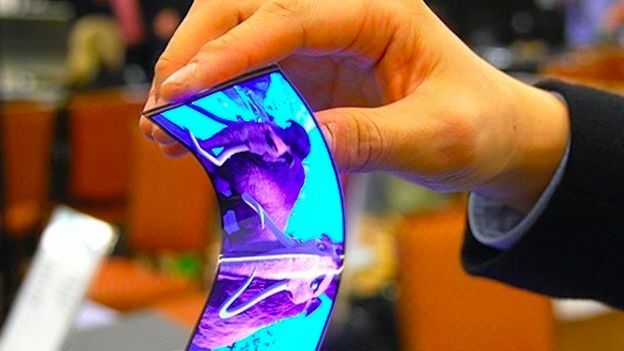 OLED screens that bend have been all the rage for the past couple of years and those that give feedback have been demonstrated through patents and concepts from the likes of Apple, Nokia and LG. Perhaps the best example of this was Nokia's Kinetic Display that was shown off at Nokia World back in 2011. The prototype allowed the device to be controlled by moving it in different directions such as twisting it to select up or down and bending it towards you to access a function. There's little detail on exactly how the AUO idea will work when used inside a smartphone or other device but if it gets further than Nokia's concept then it could eventually land inside the smartphones of the future.